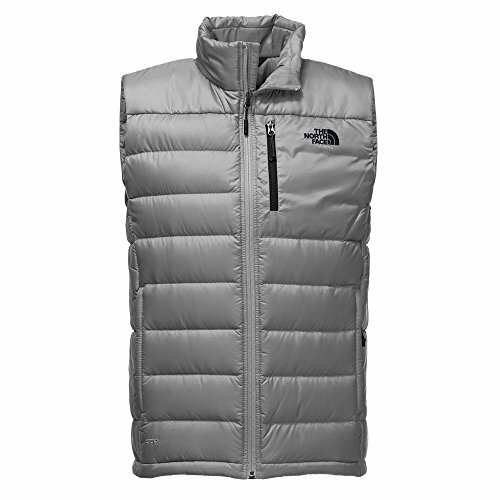 The North Face Size Chart The trusty Aconcagua Vest is the ideal go-to jacket for everything from dog walking in the middle of winter to cold-weather camping. Relaxed Fit. Nylon shell:• 40D nylon shell in a durable woven face.• DWR (durable water repellent) finish offers water-resistant protection.• 65 g/m² fabric weight. Insulation:• Goose down insulation offers high warmth with low weight.• Pairs with Heatseaker™ polyfill insulation at the side panels.• Responsibly Sourced Down process ensures that the insulation does not come from birds that have been live-plucked, or force fed, and that their welfare has been protected throughout their lifecycle. • 550 fill-power down blend.• 150 g/m² polyfill fabric weight. Stand collar with soft, brushed inner face. Full-length zip with inner draft flap. Sleeveless. Zip chest pocket. Zip hand pockets. Straight hemline. Body: 100% nylon;Pocket Bags: 100% polyester;Insulation 1: 75% minimum down fill.Insulation 2: 100% polyester. Machine wash cold, tumble dry low. Imported. Measurements: Length: 28 in Product measurements were taken using size MD. Please note that measurements may vary by size. Nylon shell:• 40D nylon shell in a durable woven face.• DWR (durable water repellent) finish offers water-resistant protection.• 65 g/m² fabric weight.